Sleep apnea is a medical problem with a dental solution. At Fresno Dental Professionals, we take sleep apnea very seriously as it can potentially be a life-threatening sleep disorder. Sleep apnea is characterized by repeated pauses in breathing during sleep. The breathing pauses can last anywhere from several seconds to minutes and happen as many as 30 times per hour. The National Institute of Health estimates that more than 12 million Americans have sleep apnea and symptoms are often undetected or misdiagnosed. 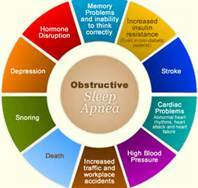 Many people do not know that they have sleep apnea until someone else witnesses it or a doctor identifies the symptoms. 1. Central Sleep Apnea (CSA) - This rarer form of sleep apnea occurs when the brain fails to send important signals to the muscles used while breathing. In this form of sleep apnea, it is not that the person cannot breathe, but rather that the brain is not telling the body to breathe. 2. Obstructive Sleep Apnea (OSA) – This is a more common form of sleep apnea and in some cases is easily treated by a dentist using an oral appliance. 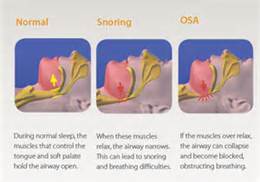 Obstructive sleep apnea occurs when air cannot flow through the nose or mouth as the body tries to breath. This pause in air flow is often due to lack of muscle tone, a large tongue, or extra tissue blocking the airway. Although our Fresno dentists are able to help those who have been diagnosed with sleep apnea, it is a medical problem that needs to be diagnosed and monitored by a medical professional. Traditional treatment for sleep apnea is a CPAP machine. A CPAP machine is prescribed by a medical doctor and applies positive airway pressure to open up airways while sleeping. Many patients complain, however, that the CPAP is too noisy, bulky, or hard to wear. For these patients, we offer oral appliances that resemble a sports mouth guard. At Fresno Dental Professionals, we have been highly successful at using oral appliances to treat patients suffering from mild to medium sleep apnea. Sleep apnea oral appliances are designed to either shift the lower jaw forward and slightly down to keep the airway open, or to keep the tongue from obstructing the airway. Patients appreciate the comfort, quietness, and compactness of this sleep apnea oral appliance. Some physicians recommend both the CPAP and an oral appliance be used to combat sleep apnea. One can be worn at home while the other may be utilized while traveling. Regardless of your selected treatment method, sleep apnea should always be followed regularly by a medical physician on a regular basis. Utilizing an oral airway appliance can make a huge difference in the life of someone suffering from sleep apnea. Patients report feeling more rested, having more energy and improved health issue such as lower blood pressure and weight loss. If you have any questions regarding sleep apnea treatment in Fresno, please feel free to give us a call or schedule a consultation today.